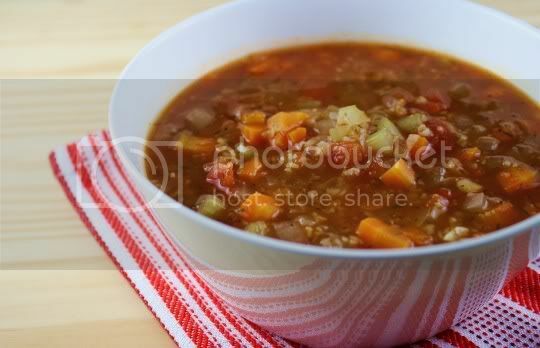 This super easy-to-make soup is the perfect combination of spring and winter: lots of veggies in a light broth, which is then thickened with hearty and earthy bulgur wheat. After prepping the veggies, this soup comes together in just about 20 minutes and will make a great starter or even main course. 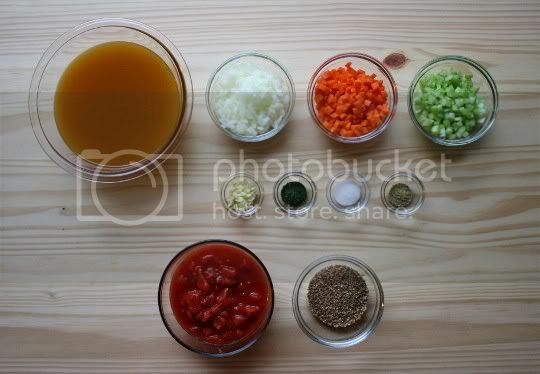 Simply combine vegetable broth, onions, carrots, celery, and garlic in a pot, along with salt and dill for seasoning. If you're using fresh dill, you'll want to add this toward the last 5 minutes of cooking instead of at this point. Next, you'll add tomatoes and bulgur, until the bulgur is cooked and has a chewy texture. The soup is tangy, salty, and sweet. For such a simple dish, it's surprisingly filling and satisfying, and the chewiness of the bulgur almost lends a feeling of eating comfort food. All of the vegetables work quite well together, and the tanginess from the tomatoes is quite addictive, hitting every part of the palate. Even the dill adds a sweet herbal flavor. If you're not a fan of dill, oregano or basil would make excellent substitutions and may even give a bit more of a "winter" flavor. Make again? Yes. Simple, tasty, and quick. 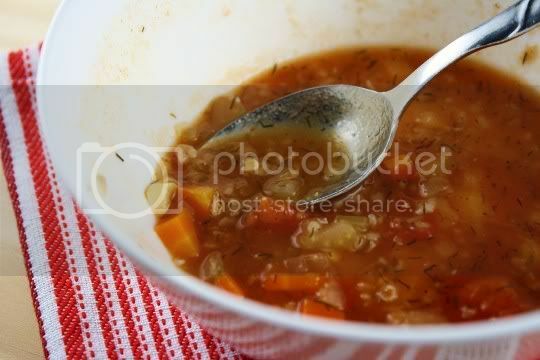 In a large soup pot, combine the vegetable stock, onions, carrots, celery, garlic, salt, dill, and fennel. Bring to a boil, then reduce heat, cover, and simmer gently for about 5 minutes. Stir in the tomatoes and their juice. Add the bulgur and mix well. Return to a boil and simmer, covered, for another 15 minutes, or until the bulgur is tender, stirring occasionally. Add pepper to taste. Serves 4-6. Recipe from "Tomato Bulgur Soup," Moosewood Restaurant Low-Fat Favorites, Clarkson Potter, 1996.